In 2018, NYIC celebrated 100 years in service! 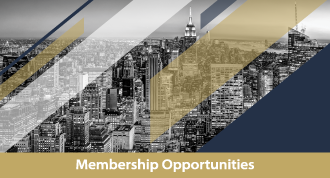 The New York Institute of Credit (NYIC) was founded in 1918 and has proven to be an industry leader by bringing together trade professionals through educational and networking opportunities. 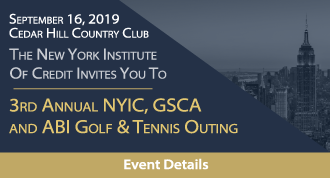 Every year, NYIC partners with other organizations to host a golf and tennis outing, providing an ideal environment for relationship building and networking. Watch this video of our 100 year celebration and all the memories that make up where the New York Institute of Credit is today. 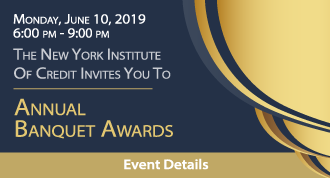 The New York Institute of Credit bridges the gap between business theory and business practice through networking and educational programs for industry professionals in the middle market. 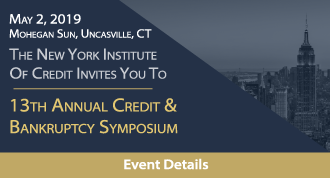 ABI, the Turnaround Management Association’s Connecticut Chapter, the Turnaround Management Association's Northeast Chapter and the New York Institute of Credit are pleased to present the 13th Annual Credit & Bankruptcy Symposium at the Mohegan Sun in Uncasville, Conn., May 2-3, 2019! Join us in our 101st year to celebrate the honorees who have strengthened our industry and built long-lasting relationships with many of us. Don't miss this event and register early. Full tables always sell out. The day commences at 11:00 a.m. with Brunch, followed by 12:30 p.m. Golf & Tennis start. Cocktail Hour with hors d’oeuvres and open bar begins at 6:00 p.m., followed by an extravagant buffet dinner. Membership organizations offer so much to individuals and organizations. NYIC promises the same! With a new membership directory feature, reduced pricing and a ton of other benefits, we assure you that joining our association will be valuable to your business and network.